I am looking forward to learning a bunch here. I am looking to buy my first kite soon. I am not sure what I'm going to buy. Maybe a two line stunt kite? I am going to reach out to Windstar Kites. I have an 11 year old that I would like to share this hobbie with . So maybe a single line to get her started. Anybody in the Pittsburgh area willing to get together to show me a thing or two? Feel free to help me with any suggestions for first time kites. I would appreciate any suggestions . I want to keep the price down below $75 . Maybe a a Prism Jazz? And a cheaper fun single line. There is a nice breeze blowing now, and I'm excited to get going. The sky was yellow and the sun was blue"
I’ve moved this topic to the beginner sport kite section for more attention. Jazz has a reputation for being tough. I have Prism's Zephyr and Snapshot 1.4 foil. Very happy with both. Very different than the Jazz. Jazz will get you flying but will limit your tricking growth if that's what you want to do. Premier Vision in that price range would take you further. A lot of folks will say spend a little more and get a Quantum. My pick in that price range is the Premier Wolf ng.I had a Premier Nighthawk that my 11 year old grand son did real well on.So did I. Upset that I sold it until he saw the replacement.Premier replaced the Nighthawk with the Wolf ng. Best place to get it is at Kites and Fun Things. They also are the kites designers. Your 11 year old can handle a duel line to start. Not saying don't get a single line kite cause there are some real cool ones. Esingers recent videos are a great example.Just not needed if duels are the goal and cost is a issue. A used decent 1.2 to 1.8 foil from $30.00 to $40.00 on Ebay would minimize damage when first learning control. I've had a 6 year old grand daughter flying my Snapshot and Hydra. Under close supervision though. A year from now and you guys are out flying your new $400.00 Benson kites (you'll have to have 2 ) and a newbie wants try flying. Hand them the Jazz or foil. Some people like the Jazz so much they get 3 or 4 and stack them. The pics and videos of those stacks are very cool. Thanks very much for your advice Breezin!!! I actually just bought a Prism Synapse 140 , and I am beyond stocked to fly it. 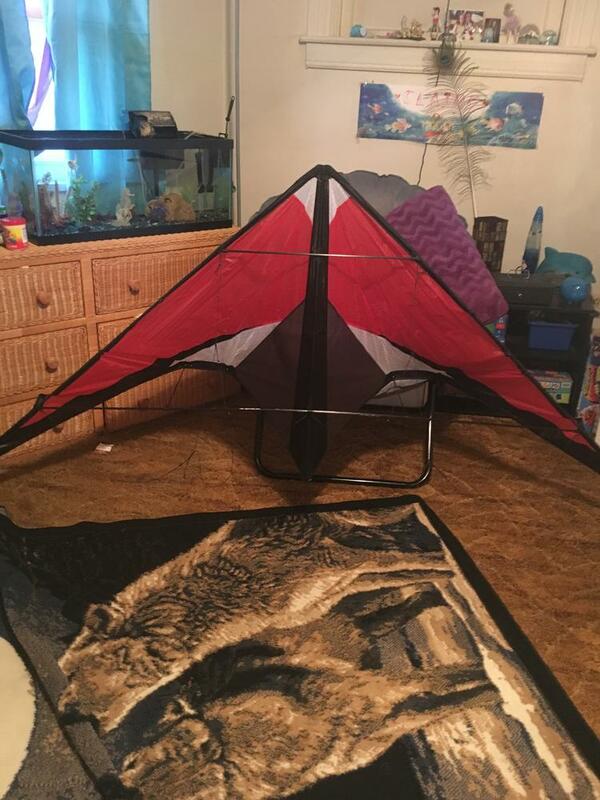 I was actually gifted a stunt kite , from a member of another forum. Sooooooooooo generous!!! He is sending me a Skyburner Freestylist UL , which looks to be a pretty nice kite!😁 I just pay the shipping. Nice folks in the kiting community!!! The Premier Wolf Ng looks like an amazing kite. Maybe one day when my skills are up to snuff. Great to know that my daughter will be able to handle the Prism foil. I want to get a single line just for fun, as I had one during a trip to Norfolk, and it was fun!! I imagine you do enjoy the Zephyr , that a pricey kite. Lol.... I can see , this could be a money pit , like every other hobbie. Jason , thanks for input and generous offer to show me the ropes!!!! That is really appreciated! !, and I will shoot you a PM, to set something up. I have zero knowledge, other than learning stuff on Youtube. It will be great to learn hands on. I checked out the 4d , and that seems like the perfect kite for our winds here in the Burgh. I will build up my skills first, as I imagine that thing would tear it up in some wind. I am really excited to get flying!! I saw that in the other post. You made out like a bandit. Enjoy. The Freestylist may need some adjustment. Ask before you fly. Have fun, smile and don't forget to breathe. The free stylist is a great kite. I had both the ul and standard but gave them to a beginner years ago. So maybe a single line to get her started. If she wants a kite to just hold, that she doesn't have to pay a ton of attention, I would suggest a small Parafoil(*with a nice long tail) or a Diamond kite with a nice long tail. If she wants a single line kite that she can control/maneuver, I would suggest tumbling box kites. The Zigy Zaggy box kite(*Made by Great Winds Kite Company) is lots of fun to fly. It's inexpensive(You can get them in packs of ten, so you both can fly at the same time and have extras for friends). It breaks down, but I don't take mine apart. It looks like a big tooth. Put a tail on it if you want it to be more stable. The Triad, made by Prism, is also fun to fly. It is a portable, keep-in-your-car kite. Be warned- Single line kite string can cut through dual line kite string very quickly. Thanks Kansas Flier . I did purchase a small foil for both of us . Prism Synapse 140, should be perfect for her. I think she will take to two line stunt flying pretty quickly. The triad Prism does look very fun. I would like to build a few box kites with my wife and daughter. I’m going to check out the Zigy Zaggy next. Thanks for all the recommendations!!! Ca lke, are the Freestylists good for beginners? I thought the UL would be pretty fragile. To make a Standard kite into an UL you reduce the weight so it will fly in lighter wind. If you leave the sail the same size, then the other heavy component is the frame, and since there won't be as much wind putting pressure on the kite you can reduce the wall thickness of the tubing quite a bit and thus reduce the overall weight of the kite. They can usually withstand a bit more than the specified wind range, but if you push it more than like 2mph beyond it expect something to snap. The kite is just as durable as it's cousin, the standard, as long as it stays in its comfort zone. A beginner can learn to fly using the Freestylist with no problem, as long as the bridle is properly adjusted. So once you have the kite in hand, get back here and let us know and we'll guide you through bridle adjustment which is fairly straightforward; towards the nose for light wind and towards the tail for strong wind. Thanks for all the valuable info!! So, can you change out the frame to a heavier gage so it's more durable? Is this worth it,or just buy a more durable kite? Do companies sell frames to interchange? How much for the frames? Flying in 4 MPH will be too fast and out of control for a newbie to handle? Once I got over the initial sticker shock for a freaking kite I learned how inexpensive it really is bang for the buck wise. The Freestylist sold new for $199.00 in 2006.Your pretty far ahead of the game as far as cost go.I'd say do some research and get a standard next. Don't think it's wise for me to start interchanging frames on duels until I learn more about how and why a kite is constructed. My intent is after I get better at flying build my own instead of changing someones designs on a stock kite. Some people seem to really have the knack for it though (you might be one)and their experiments are good reads. Riffclown ,Kareloh, Krijn, Sugerbaker to name just a few and they will respond to you. Kitebuilder.com will give you sensory overload in a very good way. Haven't been there in awhile cause I'm trying to stay focused on flying for now. From what Iv'e read Quads are the way to go for interchanging frames. Some come with 2 frames. Some vendors will give you a choice between light, medium or higher wind frames.4 mph is sweet wind for a ul or sul. Iv'e gotten good enough to fly some standards that low but that's mostly hunting the window for higher gusts. It's good practice on a standard trying some tricks as the kite is losing it's ability to fly and coming to the ground. Keeping wind in the sail in the low range really hone your timing skills with out to much risk to the kite.The 140 will start to fly pretty good in 10. 15 plus and you'll be whooping and hollering. Thanks so much Breezin !!! so getting a 3d Prism would be very similar to my UL , but probably fly better in super light winds. Like non existent wind. We seem to always have some wind here in Pittsburgh. At least 4mph , and today my phone app is saying 12.4 mph gusts. we seem to average 8kts , not too bad ah? are airport winds much different from city winds ? so if we average 8kts every month , I should have a standard kite , maybe a Quantum or ? Are these free phone wind apps somewhat accurate? You can, but on a high-end kite it may change the flying characteristics enough that it will just not fly right. The "specialty" kites like the Freestylist are built to achieve a specific balance and response from a marriage of materials and the way their weight is distributed between the span and length of the kite's dimensions. Any kite that is made with tricking as the intended quality is already on the edge of radical instability. Changing any of the components without an understanding of how the kite is designed may push it past the edge of stability and make it near impossible for even a pro to fly without making radical adjustments. It is an awesome kite that you can grow into. You don't need to baby it, just respect what it is. You will be learning to drive using a Ferrari instead of a VW Beetle, that's all. You have all that performance available to you, but you won't be able to take full advantage of it until you get a good feel for how it responds to your input. The adjustments you may need to make on the kite are like adjusting the seat, safety belts, steering wheel and mirrors of the vehicle to fit you properly so you can control where and how it goes. If the person who gave you the kite did not return the settings to neutral, it may be difficult for you to fly the first time out. We want you to succeed. For most ultralights wind up to 5mph is no issue, but you may want to make that the upper limit until you have basic control down pat. You'll be fine in 4mph winds. Thanks , I won’t be messing around with the kite. So , I need a stunt kite for 4-15kts . This is getting expensive. Well , I got a $25 Amazon card, and $50 from my step son for my birthday. I would like a fun kite for these wind speeds . I got a nice wind meter off Ebay. Took close to 2 months before I won a cheap enough bid on a really good one. Cheapo will work good for a start too. The online wind forecast here is close but usually off a bit. As much as it will be a good starter kite I am not a Quantum fan. As good as it is it's a lot of money for a starter. You got a Ferrari coming and the Quantum is maybe a turbo charged Beetle. Prism Hypnotist will serve you better in the long run. The only kite that I know of that will go from beginner to advanced flying is the Sky Dog Black Dog. Not made any more. Still a few on E bay but a little pricey I think. I got one for my grand kids and newbies to fly. Very smooth flier. Smaller but not to fast. Like it a lot. Look at the Into The Wind Kymera. Been about the best bang for the buck deal Iv'e seen in the last couple months. Iv'e got their Hydra but it's a pretty precise kite and can be a handful. Waiting for the glue to set after yesterdays debacle so I can fly it later today.All 3 are right around $125.00. The Black Dog would be cheaper to repair. When researching for my 1st kite I chose Premiers Wolf ng.$100.00 at Kites and Fun Things. While checking out a fella offered me a new Widow ng at a great price so I got it instead. Had their Nighthawk which is real close to the Wolf. Miss them a lot. Jon T is the owner of Sky Burner kites and Kites and Fun Things.Jon and his wife are very cool people to talk to. Iv'e had 4 Premier kites designed by him . Not a dud in the bunch and the Addiction will be replaced with another. I'm a big fan of his stuff. All are gone to fund the Sky Burner Widow Maker Pro. It's a Ferrari 😁. My opinion is get the Wolf. It's a very nice Cadillac. Patience. Wait to see what the kite and you can handle. I haven't flown that kite so I can't give any hands-on advice. That kite may be able to handle more than 5mph. I'm only suggesting general guidelines. You need to know what the kite does so you don't end up with 3 of the same animal. Great point Mark. I am not going to purchase anything for a while. In fact I will be learning on a friend’s kites for a while, as ke has some indistinguishable kites for learning. Basic control inputs are the same on dual-line kites, so if you start out with the foil and get it flying the way you want it there will less chance of damaging the delta when you fly it. You need to know what the kite does so you don't end up with 3 of the same animal. Now that is sound advice right there!!! Something for light, medium, and strong. Then after, get what you find to your liking, But a basic quiver has its place. Pretty humbled today. I got my first lesson. Yikes !! My mentor was patient and helpful. I guess I figured I do a little bit better. I would say I have excellent hand eye coordination!! Not so much flying a kite . Lol... hahaha.... I did a bit better flying a the small foil. My new kite, is pretty awesome!! Freestylist UL is so light 2.5 ounces for a pretty big kite. I did a number of nose dives , and she is still ticking. i knew there would be a learning curve. Well thanks John! That’s the plan . Take it slow , try to progress each time out. Here is a pic of my new Skyburner Freestylist UL. Jason found the kite very very smoothe and responsive!! The one thing you want to remember is to give to the kite when you are about to crash. Move towards the kite briskly or just drop the handles if you're about to lawn dart it. It'll take all the wham out of the crash.